The advanced search filters allow you to search the NativeAdBuzz Advert catalogue with expert precision to find the adverts most relevant to you. The filters can be combined in any way you see fit to find exactly what you are looking for. 2. Advertiser: Begin typing an advertiser domain or part of an advertiser domain. An advertiser is considered to be the domain that a viewer lands on after clicking an advert. 3. Publisher: Begin typing a publisher domain or part of a publisher domain. A publisher is considered to be the domain on which we saw the advert. 4. Network: Select an advertising network from the dropdown or select all. 5. Device: Select a device type from the drop down or select all. 6.Country: Select a country from the drop down or select all. 7. Language: Language is the language an advert headline is written in. Select a language from the dropdown or select all. 8. First Seen: Use the date selector to find adverts first discovered before or after a certain date. Leave blank for all dates. 9. Last Seen: Use the date selector to find adverts which were last seen before or after a certain date. Leave blank for all dates. Use Strength >, and Strength < to find adverts within a particular range of advert strengths. 12. 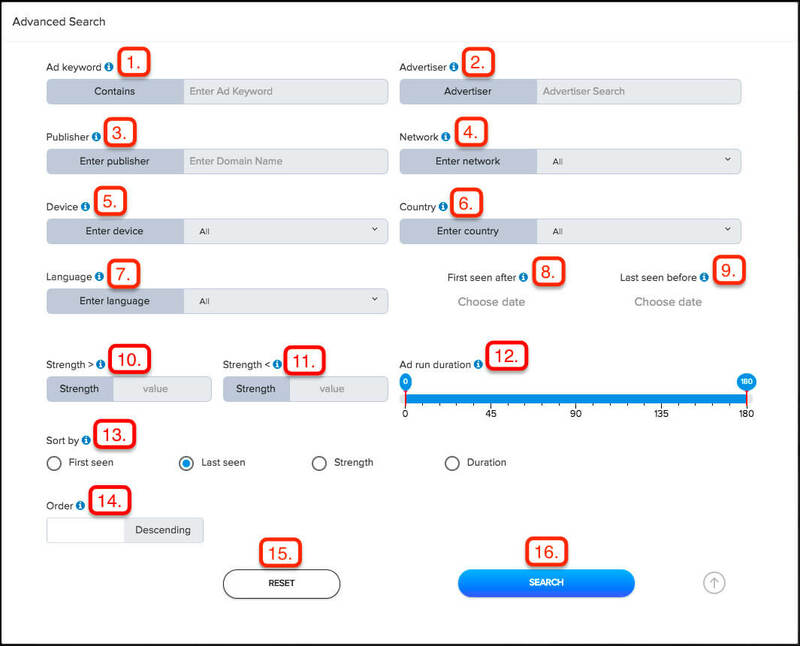 Ad Run Duration: Ad run duration is calculated as the number of days between an adverts first seen and last seen dates. Use the slider to find adverts which have been running within a chosen limit. When the upper limit is set to full at 180 there is no restriction on the maximum ad run duration, and you will find adverts which have been running 1 or more years. 14. Order: This is the order results are shown in. The default is descending with the biggest result at the top to the lowest as you scroll down. Ascending is the opposite starting with the smallest result at the top. 15. Reset: hit this to reset the search filter. Some advertisers are also publishers. This is true of sites running an arbitrage model who run adverts to their site and also host adverts on their site. Remember, the more filters you add the longer the search will take and the narrower the results. Unless you require something very specific, it is generally better to start with a broad search and then narrow the focus.